Last week we touched on creating webhooks, and this week we'll cover a way to capture a webhook and pull out information that you want to use. For this article, we'll be relying on Google Sheets using their published application capability. In order for Google to accept requests as a published application, there are two mandatory functions needed; doGet() and doPost(). These two functions correspond with the HTTP GET and POST methods and define the behavior of your script depending on how it is accessed. For our example, we'll only be using doPost(), but it is interesting to see how you could return responses to data that has been collected in the backend spreadsheet if someone performs a GET request. So the first thing you'll do is to replace the existing function with your own. In our example we don't really want our app serving anything important for a GET request, so we simply respond to any requests with a generic "request received" message. We'll be doing the bulk of our work within the doPost() function. The first thing we want to do is add a few lines to grab the data from our POST request and assign it to a variable and convert it to JSON data that we can access as a dictionary. The next few lines will set up some variable to give us some shortcuts to some data that we'll reference frequently. The bulk of the interesting data will be in the changes section of the message payload, however we'll be pulling supplemental information from other areas of the message as well. In this next block of code we're pulling out details about the current state of the artifact; the formatted ID of the work item that was changed, the name of the work item and the time of the update. Because we can have several changes that can occur on a work item at one time, we have to iterate through all of the changes in the changes section and pull out before and after values. One thing that complicates this section is that, depending on what was changed, the structure of the changes element might not always be the same. This is why we see three different methods to gather old and new values. In my example, I'm simply concatenating the results into a single string to store in a spreadsheet cell later on. This mimics the changes summary emails that are sent out by notifications, however you might want to handle each change separately for processing depending on your end goal. Finally, we log the results to a spreadsheet. And send a canned response that we received the post request. In the next dialog, we have to have the app impersonate someone who is authenticated since the webhook isn't capable of passing credentials. After clicking Deploy, you'll get a URL that you can use as a TargetURL in your webhook. You could take this URL and PATCH your webhook you created from the Creating a Webhook in Agile Central blog post. Last week, I put together an article introducing webhooks. This week we'll be covering creating your first webhook. Creating a webhook is going to require working with our REST API. It's a good idea to skim through our webhooks documentation page to get an idea of the topics discussed there as it will go into much more detail than this post will. We'll be interacting with a REST API, so it's helpful to have a client that can craft these HTTP requests with the various methods needed to handle our CRUD operations. Some people really like , however my "go to" REST client lately has been a little Chrome extension called RESTlet Client so my examples will be using that tool. Regardless of which tool you use, the concepts are generally the same. We'll also need a target URL to deliver a webhook to. Now, we're not going to be turning around and doing anything with this payload, so a simple visual indicator of delivery is all the proof we need that the webhook is firing successfully and when we expect it to. For that, I like to use Webhook Inbox. Webhook Inbox is a free and simple tool to use. You simply click one button and it gives you a unique URL to point your webhook to and it shows you the incoming webhooks in real time. The catch with this is that is only stays active for about a day so it's only useful for debugging purposes. You'll need to request a new URL and update your webhook if you come back to this a few days later. Expressions will be the fine grained rules that we use to match on. They'll usually use some form of "key", operator and value. For example, you might choose to specify a project in your expression so that if a work item is modified in that project, we'll trigger a webhook. I like to keep things simple, so I usually create a webhook that fires when one particular work item is modified. That's not useful in a production scenario, but for this example we'll keep it simple and we'll fire whenever US58 is updated. This is the destination for the payload to be delivered. This payload will always come from our datacenters, but the destination is up to you. It could be a server listening for requests behind your firewall, it could be a serverless function call in AWS, or it could be a third party service like Zapier or Flowdock. This target URL will typically be a unique destination designed to accept calls for a specific webhook. I like to use a webhook test site like Webhook Inbox to test the validity of my expressions prior to moving the webhook target into its production URL and in this case, you probably already have a Webhook Inbox set up. Before jumping into the nuts and bolts, it's important to explain the relationship between HTTP methods and CRUD operations in a RESTful interface. In general, there are four HTTP methods that get used to indicate different actions to perform with a target; GET, POST, PATCH/PUT, DELETE. Not all targets will support all operations because it's not always relevant and in some RESTful implementations, POST and PATCH or POST and PUT are used interchangeably. Our WSAPI interface is an example where the calls can use POST or PUT interchangeably to modify an artifact, however with our Pigeon API, PATCH is required to modify. In the next section down we have two areas that we want to populate; headers and body. Headers are going to contain information about what we're sending to the server to create the webhook. In this case we want to tell it that'we sending a Content-Type of application/json. If you're not already logged into Agile Central, then you'll need to click "Add Authorization" to add your username and password to the request. Then we click the "Send" button and we should get back a response from the server with a 200. The response body is going to contain a lot of valuable information and it's a good idea to keep this around while you're working on getting the webhook set up. The _ref line is very valuable for coming back to this webhook for checking on the status or for making modifications later on so copy that out to a file. Let's say you made a mistake and instead of firing on US58, you actually wanted it to fire on US59. This is where that _ref URL comes in handy. Take that URL and paste it into the address bar of the query, and change your METHOD to PATCH. This method of updating works for updating any part of the payload, including target URLs, object types, expressions, etc. In the next installment, I'll be going over how to tie a webhook into a serverless technology for further processing and data manipulation. A webhook is an interesting creature. Many people are familiar with the idea of requesting information from a RESTful API interface, but that's still a "pull" concept. What if the information came to you automatically? This is the idea behind a webhook. Years ago, we were promised push technologies that fed us information that was relevant to us. While we have services that feed us information, many of these services are still very much pull based technologies that mimic push technology. Now, with the advent of serverless computing, "if this then that" workflow processes and devops automation, we're really starting to see true push technologies coming into their own. Wehooks are a major part of this silent revolution and Agile Central supports webhooks. The bad news is, the "last mile" is missing. We can send webhooks, but there aren't many partners that are available to do anything with them. Part of the difficulty is that the payload that is sent in a webhook isn't standard across the board. You can't just simply look for a "message" parameter in a webhook and expect it to be there every time. Every vendor is free to layout their payload in any way they see fit. The Agile Central webhooks are very rich with detail. This is only a handful of the 800 lines that the original message contains. A lot of the other information contained in the payload would be current state of all fields, details around the artifact type, object IDs, etc. A sample payload can be seen here. The trigger for these is based on a variety of configurable parameters. For example, I have a webhook that always fires when DE1 is updated. This gives me a predictable way to trigger a webhook. For some, they may want a webhook that triggers any time a change is made to a User Story that is In-Progress or Defects that are in a particular project. These payloads then get delivered to a listening destination that has some code capable of parsing the JSON request contained in the body and then acting upon that code. In the next post, we'll go over how to create a webhook. On Wednesday morning, keynote speaker Troy Magennis spoke about the importance of data utilization in Agile working environments. He emphasized that "it's not good enough to just show data in a chart". People need to see and understand the importance of data they are being shown, and know how to properly act and react to that data, in order to make an impact in business and development decision making. Practicing “Watermelon Status” (green on the outside, red on the inside) deludes us and makes us unable to handle risks effectively and predict reasonable outcomes. "The more interdependencies your team has, the more likely the feature/deliverable will be delayed." "We learn more from uncertain outcomes. That means we need to release more often to verify out hypotheses." “We do forecasts and estimates not to find out that we are right. We do forecasts and estimates to find out that we are wrong." On Wednesday afternoon, Christine Hudson (Advisor, Enterprise Agility, CA Technologies) and Eric Willeke (Principal at Eric Willeke and Associates, Inc) presented on the topic of "Leadership Agility - The Executive stance in an agile business". Ronica Roth (Advisor & Team Lead, Agility Services, CA) and Michael Ball-Marian (Director of New Product Incubation) held a session on "The 3 Key Steps to Agility You Skipped: A manager's guide to intentional culture change". “Retrospectives are one of the foundational components of agile.” We need to properly inspect and reflect on our experiences in order to enable continuous learning. On Wednesday evening, the exhibitors held a special Happy Hour event, in which CA tapped into the beach-themed spirit complete with inflatable beach balls, festive swimming tubes, light-up cups, a beverage bar and even more fun giveaways. Thursday morning, Laureen Knudsen (Executive Advisor, Agile Management, CA) and Doug Dockery (Daugherty Business Solutions) presented to a full room of attendees on the topic of "The Modern PMO", sharing their stories and experiences leading some of the top agile transformations across the country. Laureen and Doug raffled 5 copies of their book, "Modern Business Management: Creating a Built-to-Change Organization" that details what a C-level executive needs to know about agility management to compete and win in today's fast-paced markets. Marla Schimke (Sr. Director, Demand Generation, CA) and Laureen Knudsen recorded an AgilityCast video/podcast to discuss some of the emerging terms "Weaponized Agile" and "Industrialized Agile" that have been heard throughout the agile community and conference. Laureen provides her expert definitions of both terms, and explains how "Weaponized Agile" can hinder an agile transformation, whereas "Industrialized Agile" can help an organization reap the benefits of agility. AgilityCast episode coming soon! Thanks for spending the week at Agile 2018 with the CA team, or following along through the blog recap series! Last week, the CA Technologies team and I were present at the Agile 2018 conference in beautiful and sunny San Diego, hosted by Agile Alliance. Once again we were title sponsors of this spectacular event, and we had the pleasure of connecting with and learning from over 2,000 members of the global agile and agile software community. At our exhibitors booth, we were asking Agile 2018 attendees the ever-important question, "What is your True North? ", or what kinds of goals are you looking to achieve in your organization? Our team engaged with attendees at all stages of their agile journey and transformation which resulted in great conversations about how CA products and services can help organizations of all sizes become purpose-driven and create an outcome oriented culture. The CA team pictured at the show floor booth, ready to welcome Agile 2018 attendees and kick off a great event! Pictured above include leaders and experts from our sales, product management, services and product marketing organization. Pictured, left: Our team of Business Agility thought leaders and Agile experts, Laureen Knudsen, Ronica Roth, Christine Hudson and Deema Dajani eagerly awaiting for the show floor to open. Pictured, right: Andrew Homeyer and Adam Zolyak from the waffle.io team ready to demo their product to attendees. Deema Dajani (Advisor, Transformation Consulting, CA) presented on Monday to a full room of attendees, on the topic of Business Agility experiments at scale. She shared 8 focus areas of Business Agility that span across strategy and execution, and across work and people that shaped the various Business Agility experiments that she and her team conducted with customers. Deema Dajani (CA) and Natalie Warnert (President & Executive Director, Women in Agile Inc.) recorded an AgilityCast video/podcast to recap the Women in Agile event on Sunday that kicked off the Agile 2018 week. Natalie and Deema shared the journey behind the creation of this powerful non-profit organization, and revealed some exciting news of how Women in Agile is growing and reaching women across the country. AgilityCast episode coming soon! We ended Tuesday night with a bang with our Networking Reception at the Hard Rock Hotel Rooftop in the historic Gaslamp Quarter in San Diego. Attendees enjoyed food, music, city sunset views, and networking with the CA sales, product, services and marketing teams and peers in the agile community. CA Technologies will again be a title sponsor at Agile 2018 next week August 6-10. This event that brings together over 2,000 members of the global agile community for the world's largest agile software conference. This year, CA is committed to helping customers drive toward the next generation of agile by focusing on being purpose driven and creating an outcome-oriented culture. Stop by our booth (#102) to meet with our experienced team of Agile experts and collect fun giveaways. Get hands-on with our product offerings in an interactive demo, discuss the future of Agile with our product leaders, or spend some dedicated time with our experts in the "Coaches Corner". Our Agile executives and leadership team will also be available for one-on-one meetings. Join our team at the Hard Rock Café in San Diego for Agile on the Rocks, CA's Agile 2018 networking event. Enjoy great views, music, apps and cocktails while you network and connect with your peers and colleagues in the industry. Register now for the Agile on the Rocks Networking Event on August 7th 6:30 pm - 9:30 pm. Our Agile 2018 booth will have a dedicated "Coaches Corner" allowing attendees to meet with an agile coach and get personalized advice on any stage of their agile transformation. Four of CA's leading Agile experts will conduct sessions on a variety of topics including project program and portfolio management, creating business agility at scale, and applying agile practices to training. There is tremendous buzz around the term Business Agility, yet only 12% of companies are on the path to achieving it. Business agility is a company's way to sense and respond to change proactively and with confidence to deliver business value, as a matter of everyday business. Your whole enterprise would be on the same heartbeat, integrating business functions with software Product organizations in a way that allows the company to pivot on a dime. Scaling it in large enterprises and in traditional industries like Insurance...is a whole other ball game. We hear all about "being agile vs doing agile." We hear that leaders have to be involved, and it can't be a checkbook commitment. We hear that we have to build organizations full of safety, optimized for the success of the teams that create our company's success. What does that mean, though? What are the behaviors senior leaders need to demonstrate to successfully lead agile organizations? Want to know how the top PMO offices are adding value and operating in the most profitable organizations? The top EPMOs and PMOs are heavily involved in their organization's transformation to a modern business. They're moving from being project focused and managing constraints to being business focused and ensuring strategic value is created. They understand the entire value stream and are no longer focused on execution. 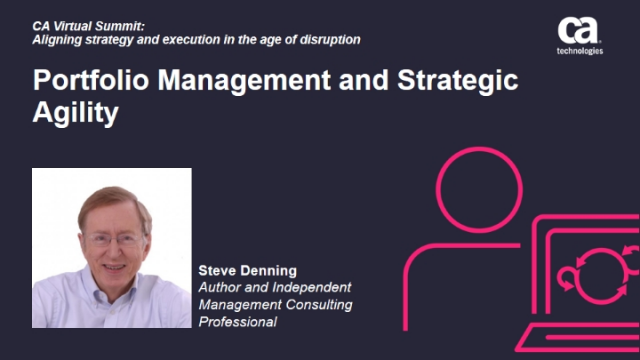 Hear real-world examples of how companies are moving from vintage Project and Program Management to today's Modern Product Management. Nearly everybody has been to the Gym. You go in January 2nd, they show you around, give you a little coaching, you pay your dues… and you never go back. You know you should though. You really ought to, but you're very busy. Does that remind you of your typical agile training experience? Together we will explore the ideas behind creating an Agile Gymnasium: a place where training is based on experimental results. A place where training improves your performance in the real world. Make sure to follow along during the event through @CA_Agile on Twitter and check back in the Agile Central Community for daily recap blogs. We hope to see you there! Velocity plays a key role in Agile Central and has been used as a key metric for Scrum teams. So, what is velocity? In simple terms, velocity calculates the total number of Points (Plan Est) at the end of the Iteration or Release. By planning and measuring your velocity, your team is able to plan more effectively and efficiently. Your velocity may differ from Iteration to Iteration, however, over time, a well-functioning Scrum Team's velocity should steadily trend upwards and stabilize. It is a great metric to forecast how many work items a Team can do in a given Iteration or Release and is a basis for improving the accuracy and reliability for planning your agile projects. It is a continuous process! Luckily for us - Agile Central offers great velocity tools to measure the pace at which teams get their work done. What can YOU do to start tracking velocity? -> Prior to a Release or Iteration, point estimates can be entered into the Planned Velocity field so the team then can commit to the completion of a set of highest ranked product backlog items. The team first commits and then the Scrum Master or a team Administrator enters the number value in the Planned Velocity field. Where is the Planned Velocity field? Timeboxes (Plan-> Timeboxes), allows you to manage Planned Velocity for your Iterations AND Releases. Use the drop down field on the top of the page to choose Releases or Iterations. Once the list populates, you can simply use the inline edit and enter the Planned Velocity number next to the Release/Iteration you need or you can click on the gear settings icon and select Edit. On the Iterations view, you can also access a Chart view in the toggle on the right side of the page, to view an iteration velocity chart averages over last 10 iterations. The chart will show you the number of accepted points per iteration. This chart can also be accessed in the Reports page -> Velocity Chart. Another great tool in Agile Central that shows you Planned Velocity is located on the Iteration Planning Board (Track -> Iteration Planning Board). This is a great App that provides you with a view of your current scheduled work items and helps you carry out Iteration Planning. You will notice a "Velocity Meter"at the top of the column, which updates automatically as you assign or update story points to your work item. The meter will turn colors based on your Planned Velocity points and your scheduled Plan Estimate points. If you click on the Velocity Meter, you are also able to easily enter in a PLANNED VELOCITY here (remember my note from above: typically it is the Scrum Master or the team Administrator who enters this!) This field will automatically change the total on the meter AS WELL as the Planned Velocity in Timeboxes. Tip: Feel free to add this app to your dashboard or custom page! And...Wait.. There's more ways to track (this is why we LOVE Agile Central)! Team Planning (Plan -> Team Planning). In this view, you are able to see the Features scheduled into a Release and a summary of its Iterations. You can click on any work item line to expand and view more details. The Iterations view provides an overview of your Planned Velocity points and its curr#ent percentage. If you have reached a number higher than your planned velocity, you will see an "issue" alert, and your iteration will be highlighted in red. You can click on the issue alert to view a message and also expand a view of current User Stories included, the Plan Est points, scheduled stated, tasks, and dependencies. By clicking on the gear box, you are able to remove a User Story from Plan, move to a different iteration, or edit. An organization’s ability to thrive, grow and stay ahead of the competition in today’s fast-moving digital economy is measured by how quickly it can utilize the people, processes, data, and technology it has to make a mental and cultural shift from doing agile to becoming agile. Staying competitive doesn’t just require agile processes at the execution level, it requires business agility that scales across the whole organization. 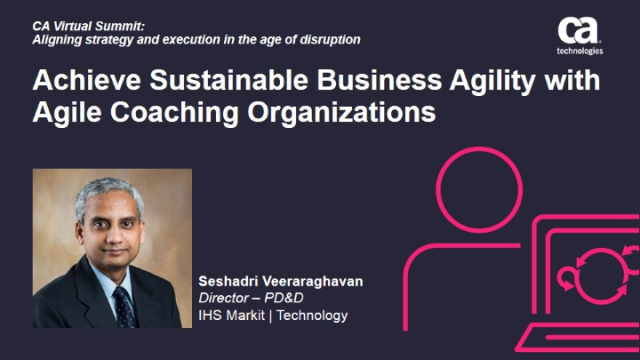 From increased collaboration, productivity, speed, efficiency and higher work-product quality—learn how utilizing Agile Software and scaling agile across your teams can maximize opportunities, customer value, and put you ahead of the digital transformation curve. 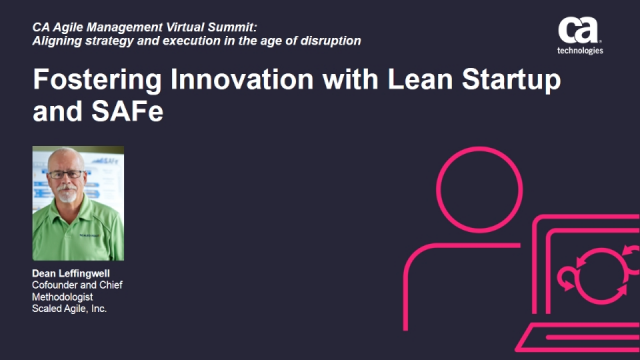 Don't miss our 3rd annual Agile Management Virtual Summit on Thursday, May 17. Check out some of the featured sessions in the Agile track, which contain topics from industry thought leaders such as Dean Leffingwell, Andy Jordan, Steve Denning, Jeffrey Hammond, and more! Dean Leffingwell, Cofounder and Chief Methodologist, Scaled Agile, Inc.
"The most important enabler of AI is ease of use. If it's not easy, it's not smart"
"We've expanded our portfolio, changing how companies can respond to challenges." "CA is introducing more than 20 new products this year at CA World." "Technology evokes in waves and accelerates business." Otto Berkes' prediction of technology in the enterprise: "By 2030, what we have come to know as IT today, will be virtually unrecognizable." (On Digital Disruption) "When something you didn't believe would actually happen, actually unfolds before your eyes"
"Technology itself is ephemeral, and software is disposable... The Modern Software Factory gives you the capability to meet your customers' ever changing needs." "The Modern Software Factory is the technology roadmap of the future"
Heather Wilson (Sr. Director, Portfolio Management, Change Healthcare) shared Change Healthcare's 90-week journey of practicing Scaled Agile Framework, and using CA Agile Central throughout their process. Heather also outlined the 9 principles of SAFe in great detail, and explained how each principle can be applied to the work of a firefighter. “Using SAFe as a differentiator has created radical change for our clients." Heather Wilson's tech talk, "SAFe as a Differentiator, Powered by CA Agile Central" documented in visual poster form, created by infographic artist, Axelle Vanaquaillie from Visual Harvesting. Martin Dremo (Development Manager, KMD) and Suzanna Ahmed (Principal Agile Consultant) outlined the challenges KMD had with working in 2015, and why they chose CA Agile Central and CA Project & Portfolio Management to meet their business needs in a SaaS environment. Bruno Savona (Sponsorship Relationship Manager, Trek Segafredo) and Marc Leijten (Advisor, Presales) at their AgilityZone tech talk discussing how Trek Segafredo uses CA PPM and CA Flowdock to support and optimize team performance. "Trek Segafredo uses CA Flowdock to achieve instant and secure communication and collaboration." Laureen Knudsen (Principal, Presales) and Doug Dockery (Sr. Director, Presales) moderated the "Modern Business Management in Action" panel discussion, featuring panelists Thomas Hall (Physician's Mutual) and Robbie Rivera (Cisco). "Business Agility is getting the right data to the right people at the right time to make the right decisions." 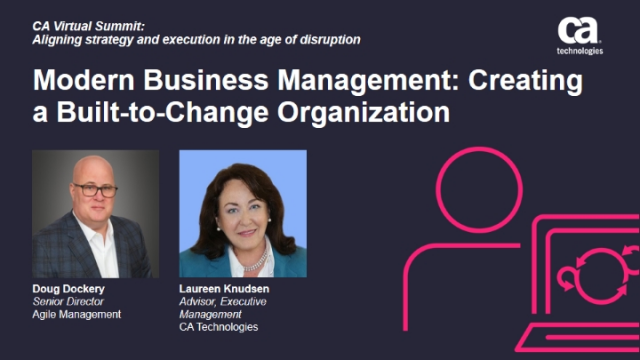 Doug and Laureen personally signed and distributed a limited number of introductory chapters from their new book, "Modern Business Management: Creating a Built-to-Change Organization". The full version of their book will be published in January. Ruth Zive (CMO, Blueprint Software Systems) and Marla Schimke (Director, Product Marketing) pictured at the Inspiration Wall in the AgilityZone. Thank you to Blueprint Systems for being a Gold Sponsor at CA World! The Agile Management area (including the AgilityZone) was full of fantastic tech talks and theater sessions led by customers, partners and our very own CA Technologies' employees. Below are additional topics that were featured at CA World. Once available, links to select presentations and session recordings will be shared below. Attendees celebrated the end to a successful CA World '17 at the No Barriers Bash, where they danced the night away to Third Eye Blind and Counting Crows' top hits. CA World 2018 in Miami, FL - See you next year! CA World '18 will be in Miami, FL next year. Join us November 12-16, 2018 at the Miami Beach Convention Center for another year of inspiration, learning and fun. Extending a big thank you to all our Agile Central session speakers, customers, partners, team members and community members. Whether you attended live or followed along virtually, thank you for being part of the CA World experience! "Excellence and success in climbing don’t come by chance. They’re founded in attention to detail, process, and grinding it out. Not heroics." "By 2020, 40% of organizations will embrace a product portfolio paradigm to manage technology investments." "With CA Agile Central, DigitalGlobe reduced time spent on maintenance by almost 40% accelerating project delivery times." Co-authors of "The AGILE Almanac Book 2: Programs with Multi and Virtual-Team Environments" pictured at their book signing and giveaway. Pictured from left to right: John Stenbeck (President, GR8PM Inc.), Nichole Tubiolo (Project Manager, Willis Towers Watson), Rick A. Morris (President, R2 Consulting), Michael Williams (Senior Executive Consultant, R2 Consulting). John Stenbeck and Rick Morris, co-authors of the "The AGILE Almanac Book 2" pictured at their high energy tech talk where they shared career-boosting hacks, and even gave away copies of "The Agile Almanac Book 1" to some lucky audience members. Dr. Sumeet Malhotra (Partner, TCS) exposed common cost overheads during agile projects, and offered a number of recommendations to save on these costs. Thank you to Tata Consultancy Services (TCS) for being a Platinum Sponsor at CA World! (On executive sponsorship in an agile transformation) “Find your channels...and persist with enthusiasm." Last year, the AgilityZone tech talk "Agile 101: Day in the Life of an Agile Team" had such a terrific turnout that we brought it back this year. Shay Boudreaux (Principal Product Manager) and Doug Diehnelt (Director, Software Engineering) shared what it feels like to be part of a high-performing Agile team, including ceremonies, activities, tools and the very culture that powers teams practicing Agile. Shannon Mason (VP, Product Management) and Ronica Roth (Lead, Agility Services Practice Dev) presented on the topic of "The Neuroscience of Program Planning and Execution" in the AgilityZone. Shannon and Ronica emphasized the mindset that organizations are successful because of the very people that power them. They also shared best practices on how to facilitate leadership that fosters co-creation, decision making and commitment. From exhibition floor opening to closing, our product team was hard at work, constantly engaging with attendees and providing them with live demos of CA Agile Central. Our demo pods particularly focused on the themes of Modern Quality Management, Dependency Management and Cross-Enterprise Business Views. Our Agile Central Smart Bar was also buzzing with interest, as attendees stopped by to ask our Principal Agile Consultants questions and to receive live support and assistance. Extending a tremendous thanks to our demo staff: Matt Gorbsky, Dan Green, Val Zolyak, Doug Diehnelt, Ryan Scott, Shay Boudreaux and Scott Nusz, and also to our smart bar staff: Rusty Lloyd, Thom Gray, Suzanna Ahmed, and Thomas Lukareski for providing highly specialized and valuable support for our customers and attendees! The Agile Management content area hired artist and visual strategist, Axelle Vanquaillie from Visual Harvesting (pictured, left) to create infographic posters of some of the Agile Central and PPM sessions and tech talks. Axelle did an incredible job at capturing the session's facts and key takeaways, and transforming notes into visually engaging, infographic-style posters that attendees can enjoy for years to come. "Being more responsive to business partner needs"
"Collaboration, and co-location of team." "Empowering people to make good decisions"
"Watching Big Room Planning happen." Thanks for reading Day 1 of the CA World '17 recap! Check out the recap blog posts for the Pre-Conference days, and Day 2 for even more pictures, key learnings and soundbites, and event highlights. Welcome to CA World '17! This year, industry leaders, tech gurus, agile software experts, and CA customers and prospects gathered once again at The Mandalay Bay in Las Vegas, Nevada for CA World '17. Starting Monday morning 11/13, the Agile Central and Agile Academy teams stocked the Pre-Conference (Monday and Tuesday) schedule with highly interactive learning sessions and certification opportunities. For those who were not able to join in the festivities live, or for those who want to re-live the excitement of CA World, continue reading this post, and also check out part 2 (Wednesday) and part 3 (Thursday) of this blog series for a recap of Agile Central's involvement and presence at CA World '17. On Monday and Tuesday, the Agile Academy team conducted all-day Agile Bootcamp classes, as well as a number of certification courses such as Certified ScrumMaster (CSM), Certified Scrum Product Owner (CSPO) and Leading SAFe 4.5 to name a few. Didn't get a chance to get certified at CA World '17? View upcoming Agile Academy certification & course offerings. Our Agile Central product leaders, Scott Nusz, Doug Diehnelt, Val Zolyak and Shannon Mason (pictured from left to right, above) conducted a half-day pre-conference education workshop on the topic of how our CA Agile Central team uses our own product. "To achieve success, find your coalition of the willing." (On tracking work) "When you look at CA Agile Central data, it can trigger important questions." "We strive to build a culture of sustainability, over a culture of heroism." More Agile Central leaders connect with customers in a roundtable discussion. Shannon Mason (VP, Product Management) and Dilshad Simons (SVP, Product Management) provided a sneak peek of Agile Central product vision, and Laureen Knudsen (Principal, Presales) hosted a Business Agility Hackathon. Pictured Above: AgilityZone managers Melissa Gallegos (Engineering Program Manager) and Joy Kohnken (Sr. Principal Events), with Agile Central team members gathering in the AgilityZone to prep for the next 2 days full of tech talks, Agile exercises/games, and open space sessions. Jeff Moloughney (VP, Product Marketing, Agile Management) sharing last words of motivation and advice to the Agile Management staff before we open up the exhibition center for the next 2 days. Pictured above: Behind the scenes theater set-up. The Agile Management theater was the largest theater in the exhibition center, and would later in the week feature customer sessions from GE Transportation, and T-Mobile, to name a few. Read the Agile Central at CA World '17 Wednesday and Thursday recap posts to re-live the Agile Central and AgilityZone exhibition center experience! Are you finding it challenging to get the most out of CA Agile Central, or are you new to the platform, and not sure where to start? The CA Agile Central Power User is an in-person, 2-day course that supports new and beginner-level users. This course will help you build the foundation of your Agile Central platform from the ground up including creating your custom workspace, navigating pages, managing product backlogs, user stories, defects and more. We hear this a lot as people are wrapping up our CA Agile Central Power User class. We know how frustrating and time consuming it can be to DIY with such a robust platform. That’s why nothing beats immersion and collaboration with other customers who may be using our features in unique ways. This is your chance to discover new ways to interact with the platform and other Agile Central users. Understanding the how and why of visibility options allows you to leverage that information for better results across your agile organization. With training, you’re most likely to use Agile Central to support your agile transformation rather than watching your path to agile nirvana be constrained by a powerful tool. Not only will you become more comfortable with the platform, you’ll be a driver for your organization’s proficiency with agile best practices. This course has been designed with you in mind. If you’re a new user or you’ve had the tool for a while and you’re still feeling like you’re not using it to its fullest potential, this course is for you. You’ll get more personalized instruction than traditional digital onboarding, so you can quickly master CA Agile Central. This year, CA World '17 is packed with content focused on achieving business agility. Listen and learn from case studies and stories from notable companies like NBC Universal, GE Transportation, Datacom and more. This year’s four-day event offers something for everyone. Check out our list of exciting offerings below, where you will get valuable learnings you need to inspire and advance your agile transformation. Smart bar - we're here to answer your questions! Download the CA Agile Central session catalog. Thank you for following our journey at Agile 2017 on social media @CA_Agile, and in this community blog series this past week. Here is a recap of our last 2 days at the Agile 2017 conference. Skip Angel (Sr. Director, Enterprise Agility) hosted a workshop on "Designing your Transformation Roadmap" that was highly attended and interactive. Attendees learned the importance of creating a roadmap to guide their transformational journey, and utilized transformation planning cards and other techniques to help them develop this roadmap. View PPT slides and the transformation roadmap planning cards. Natalie Warnert (Principal Agile Consultant) gave a fascinating presentation on the topic of customer feedback, and its effect on developing a Minimum Viable Product. She showed real world examples of how she has seen MVP feedback used and abused across multiple large retail products and features. She also describes key strategies to shift the traditional way of thinking to a leaner model while preserving options for delivery through “just enough” user feedback. View PPT slides. The Project Management Tree Swing Cartoon was seen in a couple presentations at Agile 2017. This cartoon is a humorous metaphor has been used to illustrate the waterfall model of software development. Live entertainment at the Agile 2017 Conference Party at the Pointe Orlando. Denise Jacobs (Speaker + Creativity Evangelist, The Creative Dose) ended Agile 2017 with a relatable and inspiring session, called "Banish Your Inner Critic", where she addressed the natural fears we have about our ability to produce and thrive in our personal and professional lives, and offered some creative methods to help confront and deal with these fears. "Impostor syndrome and the inner critic keeps us from fully contributing in the workplace." "In order to banish your inner critic, you must first recognize your inner critical voice." "We have mental power tools to help deal with the inner critic, such as focus, mindfulness and self-compassion." "Know your uniqueness advantage, and capitalize on it." Thank you for following our journey at Agile 2017! The team had a blast at day 3 of the Agile 2017 conference, starting off the morning with a keynote session by Jez Humble, co-author of The DevOps Handbook, Lean Enterprise, who spoke on the topic of Continuous Delivery in Agile. "Give people the tools they need and the authority to change the process to build quality in." "If we didn't alienate 80% of the workforce, we could have the talent we need in engineering." Tip for taking charge of WIP: "Consider setting WIP limits that reflect current reality"
(On WIP overload) "We would rather take on something new/shiny rather than do grunt work needed to finish an unglamorous project"
Tom Perry (Agile Transformation Consultant) shares with Caitlin Lam (Product Marketing Manager) his findings from the conference sessions so far. Christine Hudson and Ronica Roth discuss important Agile Transformation themes in a recording of AgiltiyCast, for Business. Wednesday concluded with Agile Alliance Members' Meeting, and the Agile 2017 Extravagan-ZOO in the expo hall. The CA booth was buzzing with activity as our team provided product demos, networking, answering questions, and handing out treats at our ice cream stand! Fully embracing the zoo theme in front of the CA booth. Continue following us on social media @CA_Agile, and stay tuned on the community throughout the week for day-to-day recaps, pictures and tweet-worthy insights that are echoing the "latest and greatest" in the world of business agility and agile software.